There was plenty of straight talk at the first ever telephone town hall. The volunteers and call screeners were ready, and the countdown was on. 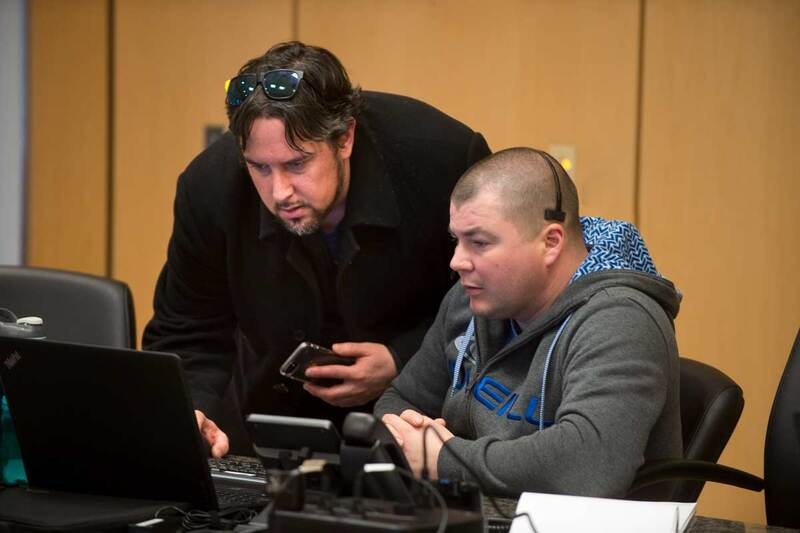 The boardroom of the ARCCAW Union Hall in Edmonton was transformed into a makeshift call centre – the first point of contact for members calling in with questions for Executive Secretary Treasurer Derrick Schulte. When the clock hit 7:30 p.m. on April 11, the Carpenter’s first telephone town hall was underway and by all accounts, it was a success. The start time was chosen to give crews working in remote locations such as Fort Hills the time needed to get back to their lodging from the jobsite and call in. Groups of members organized makeshift meeting spaces in hotel rooms where they could call in with their questions and listen to other issues as they were discussed. “The sole purpose of this town hall was to connect with our members who are working in camps and remote locations and don’t have the opportunity to connect with their union representatives, or union executive to have their questions answered,” Schulte explained. Six screening stations were were manned by a few hired communications and technical experts who worked alongside volunteers from Local 1325. Members calling in were asked to conduct themselves as they would if they came to any meeting at the Hall. Volunteers screened each call and would then send them through to ARCCAW EST Derrick Schulte and Jeff Sloychuk, Recruitment and Communications Specialist for the ARCCAW. All totalled, around a dozen questions were handled, with no time for rebuttals or follow up questions. The next Carpenter’s Telephone Town Hall is scheduled for this summer. “We’re constantly learning and looking to access new technology so we can continually improve our connection to our members and address their concerns,” Schulte said.